With diverse geography and culture, Belize has so much to offer travelers, including a wide variety of interesting, beautiful and exciting destinations. From cities and towns to historical sites located off the beaten path, Belize is full of treasures just waiting to be discovered and experienced by new and returning visitors. Belize City While in Belize City, there are several areas and attractions to explore. The Museum of Belize is located in the city's old prison and features photographs and artifacts documenting the history of the ancient Maya as well as more than 350 years of the city's history. Old Belize is also a museum of sorts, re-enacting life in Belize from years gone by. Other recommended activities in Belize City include taking in the old world charm of the colonial architecture of the Fort George District. Belize Zoo Located approximately one hour from Belize City, The Belize Zoo is also a popular attraction with tourists, providing opportunities to see majestic and beautiful native animals such as jaguars and scarlet macaws. Mayan Ruins to the North Altun Ha is the closest archaeological site to Belize City and features two excavated main plazas as well as several temples and residential structures. Altun Ha is also the site where Belize's famous Jade Head was discovered. As one of the country's largest Mayan centers, Lamanai is located in the Orange Walk District and features impressive, monumental architecture. This particular site provides visitors with the opportunity to experience a glimpse into ancient Maya culture as well as the incredible biodiversity of the surrounding tropical forest. Corozal & Orange Walk Town For travelers heading into northern Belize, popular towns to visit include Corozal and Orange Walk Town. Located just 10 miles from the Mexican border, Corozal is a charming seaside town known for its scenic beauty and peaceful atmosphere. Orange Walk Town is situated to the southeast of Corozal. Named for the orange groves that were once common to the area, Orange Walk Town provides a unique opportunity for travelers to experience the culture of northern Belize. In this town, Spanish influence is clearly evident, with tortilla factories, mission churches and Spanish architecture to be found throughout the area. Placencia Well known for its annual June Lobster Festival, Placencia is a laid-back, charming Creole fishing village with plenty of sunshine and white sand beaches. We recommend staying in the village, at the end of the peninsula to experience the true Placencia. There are numerous small lodges with cabanas right on the beach, lots of small restaurants to dine at each day, and also one of the best ice-cream parlours in all of Belize! Placencia is a little far from the reef for snorkelling and diving, however it is a great destination for sunning yourself. San Ignacio & the Cayo District One of the more lively towns in Belize is San Ignacio in the Cayo District, along the western boarder of Belize. With an abundance of ancient Maya temples and palaces, there are several sites including Xunantunich, Caracol and Cahal Pech, among many others. Caracol is situated in the Cayo District and provides breathtaking views of the surrounding jungle from its main temple. The day trip to Actun Tunichil Muknal (ATM for short) is a spectacular trip into the fascinating Mayan underworld. Swim, hike, and spelunk up to the Crystal Maiden at the head of the cave...you won’t be disappointed! Caye Caulker A small island community on the Belize Barrier Reef, not far from Belize City, Caye Caulker is a great destination for people looking to do activities such as scuba diving or snorkelling trips. Accommodations tend to be more rustic on this island, but offer a more authentic Belizean experience. Smaller “mom & pop” lodges are more the norm, to the larger resorts on Ambergris Caye. Be sure to hang out at the reggae bar at the split, and enjoy the cool breeze. San Pedro, Ambergris Caye Belize’s premier resort community is a great place for people looking for a pampered resort experience. With a range of higher end resorts, guests staying at the resorts can opt to dine at the hotel restaurant or venture into town. If you are looking for the most variety of restaurants, bars, and nightclubs in a resort setting, then San Pedro is the place for you. One of Belize's most well-known day trip options is accessible from here, the Hol Chan Marine Reserve, which straddles the Belize Barrier Reef and includes Shark Ray Alley where snorkelers can enjoy up-close experiences with gentle stingrays and nurse sharks. Dangriga & Tobacco Caye Dangriga, in the Stann Creek District is not generally considered a travellers vacation destination. An average working town, it is often used as a jumping off point for heading to the barrier reef. Boat rides to Tobacco Caye can be organized daily, with boats leaving early in the afternoon from the Riverside Cafe on the river running through town. One of the most popular destinations is Tobacco Caye, which is a small island perched right on the barrier reef. Tobacco Caye is comprised of 5 small lodges owned and operated by local Belizean families. Most travellers will catch a boat out from the mainland, and organize a place to stay once they are out there. Glover’s Reef Located approximately 36 miles off the mainland of Belize is an elliptical shaped reef surrounding a group of tropical islands cradled in a turquoise lagoon. Within the lagoon there are over 600 recorded ‘patch reefs’ making it an ideal location for snorkelling, scuba diving and sea kayaking. Like Tobacco Caye, access to Glover’s Reef is by boat from the seaside town of Dangriga. Lighthouse Reef Located roughly 50 or 60 miles east of Belize City is the Half-Moon Caye National Monument and Blue Hole, perhaps Belize's most notable marine attraction. A circular hole that measures 1000 feet in diameter and more than 400 feet in depth, the Blue Hole is visible from outer space and is Belize’s most popular dive site. Many day and overnight trips are offered to this sinkhole where divers can swim amongst giant groupers, reef sharks and numerous species of fish. For many avid divers, Belize's Great Blue Hole makes the list of the world's top dive destinations. Punta Gorda Changing direction and focusing on the southern region of Belize, other towns which travelers may wish to visit include Punta Gorda. Travelers can still swim in the Bay of Honduras and enjoy the low-key atmosphere of this seaside town. Many travelers find that Punta Gorda is an excellent base for excursions to the southern cayes or into the Mayan region of the Toledo District.With diverse geography and culture, Belize has so much to offer travelers, including a wide variety of interesting, beautiful and exciting destinations. From cities and towns to historical sites located off the beaten path, Belize is full of treasures just waiting to be discovered and experienced by new and returning visitors. Belize City While in Belize City, there are several areas and attractions to explore. The Museum of Belize is located in the city's old prison and features photographs and artifacts documenting the history of the ancient Maya as well as more than 350 years of the city's history. Old Belize is also a museum of sorts, re-enacting life in Belize from years gone by. Other recommended activities in Belize City include taking in the old world charm of the colonial architecture of the Fort George District. Belize Zoo Located approximately one hour from Belize City, The Belize Zoo is also a popular attraction with tourists, providing opportunities to see majestic and beautiful native animals such as jaguars and scarlet macaws. Mayan Ruins to the North Altun Ha is the closest archaeological site to Belize City and features two excavated main plazas as well as several temples and residential structures. Altun Ha is also the site where Belize's famous Jade Head was discovered. As one of the country's largest Mayan centers, Lamanai is located in the Orange Walk District and features impressive, monumental architecture. This particular site provides visitors with the opportunity to experience a glimpse into ancient Maya culture as well as the incredible biodiversity of the surrounding tropical forest. Corozal & Orange Walk Town For travelers heading into northern Belize, popular towns to visit include Corozal and Orange Walk Town. Located just 10 miles from the Mexican border, Corozal is a charming seaside town known for its scenic beauty and peaceful atmosphere. Orange Walk Town is situated to the southeast of Corozal. Named for the orange groves that were once common to the area, Orange Walk Town provides a unique opportunity for travelers to experience the culture of northern Belize. In this town, Spanish influence is clearly evident, with tortilla factories, mission churches and Spanish architecture to be found throughout the area. Placencia Well known for its annual June Lobster Festival, Placencia is a laid-back, charming Creole fishing village with plenty of sunshine and white sand beaches. We recommend staying in the village, at the end of the peninsula to experience the true Placencia. There are numerous small lodges with cabanas right on the beach, lots of small restaurants to dine at each day, and also one of the best ice-cream parlours in all of Belize! Placencia is a little far from the reef for snorkelling and diving, however it is a great destination for sunning yourself. San Ignacio & the Cayo District One of the more lively towns in Belize is San Ignacio in the Cayo District, along the western boarder of Belize. With an abundance of ancient Maya temples and palaces, there are several sites including Xunantunich, Caracol and Cahal Pech, among many others. Caracol is situated in the Cayo District and provides breathtaking views of the surrounding jungle from its main temple. 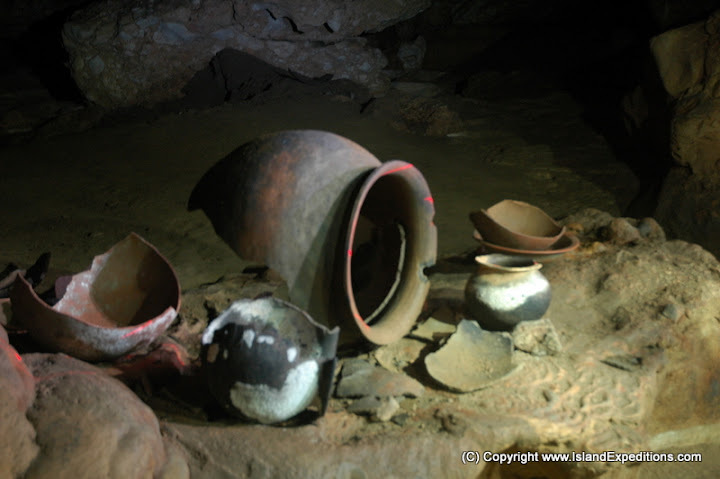 The day trip to Actun Tunichil Muknal (ATM for short) is a spectacular trip into the fascinating Mayan underworld. Swim, hike, and spelunk up to the Crystal Maiden at the head of the cave...you won’t be disappointed! Caye Caulker A small island community on the Belize Barrier Reef, not far from Belize City, Caye Caulker is a great destination for people looking to do activities such as scuba diving or snorkelling trips. Accommodations tend to be more rustic on this island, but offer a more authentic Belizean experience. Smaller “mom & pop” lodges are more the norm, to the larger resorts on Ambergris Caye. Be sure to hang out at the reggae bar at the split, and enjoy the cool breeze. San Pedro, Ambergris Caye Belize’s premier resort community is a great place for people looking for a pampered resort experience. With a range of higher end resorts, guests staying at the resorts can opt to dine at the hotel restaurant or venture into town. If you are looking for the most variety of restaurants, bars, and nightclubs in a resort setting, then San Pedro is the place for you. One of Belize's most well-known day trip options is accessible from here, the Hol Chan Marine Reserve, which straddles the Belize Barrier Reef and includes Shark Ray Alley where snorkelers can enjoy up-close experiences with gentle stingrays and nurse sharks. Dangriga & Tobacco Caye Dangriga, in the Stann Creek District is not generally considered a travellers vacation destination. An average working town, it is often used as a jumping off point for heading to the barrier reef. Boat rides to Tobacco Caye can be organized daily, with boats leaving early in the afternoon from the Riverside Cafe on the river running through town. One of the most popular destinations is Tobacco Caye, which is a small island perched right on the barrier reef. Tobacco Caye is comprised of 5 small lodges owned and operated by local Belizean families. Most travellers will catch a boat out from the mainland, and organize a place to stay once they are out there. 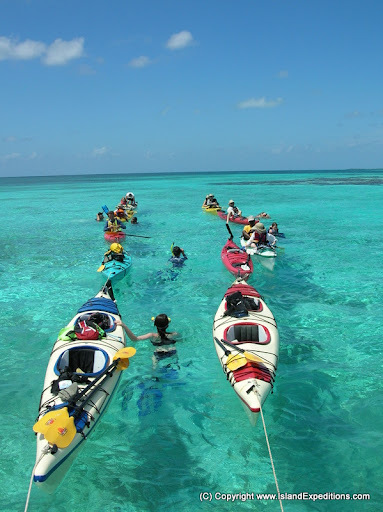 Glover’s Reef Located approximately 36 miles off the mainland of Belize is an elliptical shaped reef surrounding a group of tropical islands cradled in a turquoise lagoon. Within the lagoon there are over 600 recorded ‘patch reefs’ making it an ideal location for snorkelling, scuba diving and sea kayaking. Like Tobacco Caye, access to Glover’s Reef is by boat from the seaside town of Dangriga. Lighthouse Reef Located roughly 50 or 60 miles east of Belize City is the Half-Moon Caye National Monument and Blue Hole, perhaps Belize's most notable marine attraction. A circular hole that measures 1000 feet in diameter and more than 400 feet in depth, the Blue Hole is visible from outer space and is Belize’s most popular dive site. Many day and overnight trips are offered to this sinkhole where divers can swim amongst giant groupers, reef sharks and numerous species of fish. For many avid divers, Belize's Great Blue Hole makes the list of the world's top dive destinations. Punta Gorda Changing direction and focusing on the southern region of Belize, other towns which travelers may wish to visit include Punta Gorda. Travelers can still swim in the Bay of Honduras and enjoy the low-key atmosphere of this seaside town. Many travelers find that Punta Gorda is an excellent base for excursions to the southern cayes or into the Mayan region of the Toledo District.